The is a fantastic tungsten-carbide ring. It is 8mm wide and has a groove in the center of the ring. 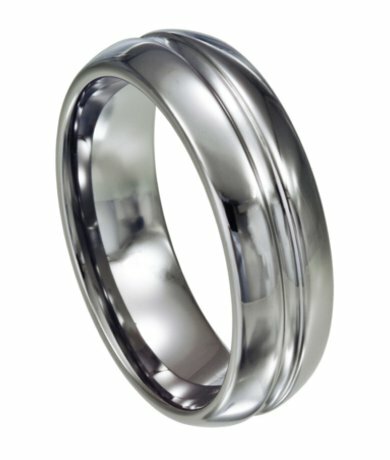 Tungsten rings are the highest strength ring that you can buy, and perfect for the active man. Comfort fit tungsten rings usually run 1/2 size larger, it is suggested you buy a half size smaller than your standard ring size. We recommend having your finger measured for a comfort fit ring at your local jewelry store for an accurate fit. All of our tungsten rings come with a lifetime warranty. It was very nice but to shinny for my man hands he's a working redneck so dont need a bling, bling on but bought another tugsten ring looks darker and just got some shine on the end of it and he loves it. I bought this ring for my husband because of its durability and style. Since my husband is in the Army, he needs the toughest ring out there. The ring is heavy, durable, and comfortable. I will never look any where else to buy his rings. Needless to say, I think their products are cheap yet they have the best quality that I have ever seen.